Bistra Velichkova was born in 1986 in Sofia, Bulgaria. She received a joint MSc degree in European Studies from the University of Twente, the Netherlands, and the Westfälische Wilhelms-University of Münster, Germany (2011). She obtained her BA degree in Journalism from the Sofia University St. Kliment Ohridski, Bulgaria (2009). 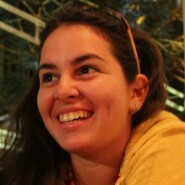 Currently, Bistra is a PhD Student in Journalism and Literature at Sofia University. Since 2016, she has been a lecturer at the annual summer Petya Dubarova Poetry Workshop in Burgas. In 2012, whilst she was working on her first book, Bistra was appointed a fellow in the fifth annual edition of the Elizabeth Kostova Foundation’s Sozopol Fiction Seminars. Bistra’s debut short story collection, Small, Dirty and Sad, came out just two years later (Riva, 2014). It won first place in the Southern Spring National Contest for Debut Literature in Haskovo, Bulgaria (2015). Later on, it was included in a catalogue featuring contemporary Bulgarian authors, designed for distribution at the 2016 Frankfurt Book Fair (National Book Centre, National Palace of Culture, 2015). Bistra’s short story collection was also nominated for the 2016 Vanya Konstantinova literary award, Bulgaria. Velichkova is also the author of a poetry collection, God’s Waiting for the Dealer (Ergo, 2018). Bistra has also won several other literary contests in Bulgaria: the Rashko Sugarev (2012) and the Paris Without Love (2010) short story competitions; as well as the Veselin Hanchev (2012), the Dimitar Boyadzhiev (2013), and the Tsarevo’s Municipality With Sea in the Heart (2016) poetry awards. Bistra’s fiction works have appeared in English in Drunken Boat, Catamaran Literary Reader, and Fiction Writers Review. In Bulgarian, she has published poetry and prose with Literary Newspaper, Starshel, Trud (newspapers); Granta Bulgaria, Stranitsa, LIK, More, NO poezia (magazines); LiterNet, Crosspoint, Dictum, Fakel, E-sushnost (online media).